33Cav added a comment to T3018: effect computers are not capped at max main size. Capping at 100% ratio doesnt allow for 100% conversion to a damage type. The numbers for primary, secondary and tertiary damage types (at 100% ratio) will thus be capped at 83%, 67% and 50% respectively. 33Cav added a comment to T2394: recall pickup area is used relative to mothership instead of the actual entity. Actually the problem extends much further than OP realises. 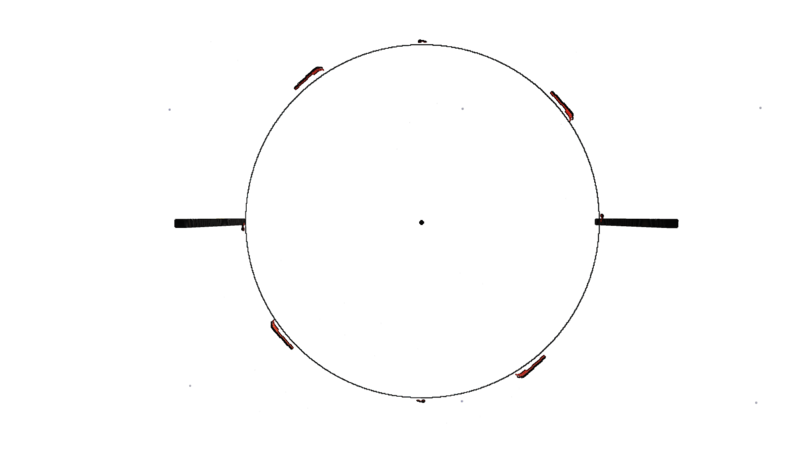 If you dock the mothership to a station using a pickup point the drones will attempt to dock in the vicinity of the pickup point on the station instead of the drone bay of the mothership even when the mothership is undocked and in an adjacent sector. 33Cav added a comment to T156: gravity unit does not activate/deactivate with logic gates inbetween. The actual issue is that only activation modules trigger gravity modules. If you set up a trigger area controller the activation module that you send its output to can trigger a gravity module with no issue. Restricted Application changed the status of T2898: Shield Bubbles provide hollow shielding from "Feedback" to "Open". This one is a bit tricky. Having noticed similar, though not identical, instances of this issue (ship taking damage while shield is up) I have been unable to tie this to any specific reproducible scenario (and why I have been avoiding putting in a report for this until I at least found something I could point at, so far I have nothing except for one thing.... I have ONLY seen this on multiplayer). At first I thought the issue was piercing effect as a weapon support but that didnt happen. Then I even tried pushing a reactor to well over 100% power usage and shooting that target and couldnt get it to happen. I even put over 100% stabilization on a ship (previously had found it on ships with less than 100%) and found that it did happen but couldnt identify the cause. 33Cav created T2896: Faction role ID is 0-4 while the command that sets it uses 1-5 as the parameter. 33Cav added a comment to T2882: Saving to blueprint is incomplete. [ver 0.200.334] I am unable to reproduce in Singleplayer or Multiplayer. Saving with Save Blueprint and spawning using Admin Load both work fine for me. Even saving to local from multiplayer and uploading the blueprint from local work with no issues. 33Cav added a comment to T2883: Shipyard Design load from Catalog and Blueprint broken. 33Cav added a comment to T2862: Jump auto charge does not use energy while charging. 33Cav added a comment to T1983: Turret aim problem. I've had this happen with turrets docked to entities not controlled by the player. If I'm in the ship the turrets are docked to I don't seem to have the issue. 33Cav edited the description of T2520: Docked entities transfer % SHP damaged effects to parent entities. 33Cav updated subscribers of T2520: Docked entities transfer % SHP damaged effects to parent entities. 33Cav created T2520: Docked entities transfer % SHP damaged effects to parent entities. 33Cav created T2461: Pasting a shipcore and faction block onto a ship or station prevents the placement of the faction block. 33Cav added a comment to T2118: Add dimensional limits to game config. 2 could be a result of the core counting as 2m cube. In your example did you add 19 or 20 blocks to reach dimension of 21? 33Cav added a comment to T268: top right messages get in the way of HUD. Just to be clear, the current block count limit does not prevent you from making something larger than specified. It does exactly what it says it does which is disable systems on a ship not conforming to the set limit. 33Cav created T2226: Chunk16 to chunk32 converter slices ship into sections. 33Cav added a comment to T1892: White Light Bar can't be switched off or connected to logic. Well I know that it can turn on and off now. (100% since 0.199.349 and probably a few patches before). 33Cav added a comment to T2090: AI fires tracking missiles without locking enemy. Only problem I can reproduce is the immediate lock time for missiles managed by AI (where players would have to wait for the time). AI seems eminently capable of tracking targets with missiles. It is possible that what you observed is due to the target ships being too close and the missile not turning enough to hit them on the first pass. 33Cav added a comment to T2199: Template paste crash. What blocks were removed since the introduction of templates? 33Cav added a comment to T2214: Navigation menu mass of docks is always 0.1. Same with designs in a shipyard. Also relogging will set mass on nav of docked turrets and ships to 0.1. Unsure if this has any effect on the mass required to be enhanced by rail mass enhancers. 33Cav added a comment to T1652: Visual Bug: Using a non-weapon block on your hotbar will visually output as if you are using a output weapon to everyone else except the pilot. This has been around since probably the change from old rails to new rail system or shortly afterwards. The bug is to do with slot 1 and ONLY slot 1 on hotbar 1. The pilot will never see the effect of this only other players. As far as I can tell it is pot luck wether damage is actually done by any weapons in slot 1 but it will trigger faction auto declare war when I last tested it. Having salvage beams in slot 1 could cause extreme and unintentional fps drops for other players since most players are not aware of the issue, even now. 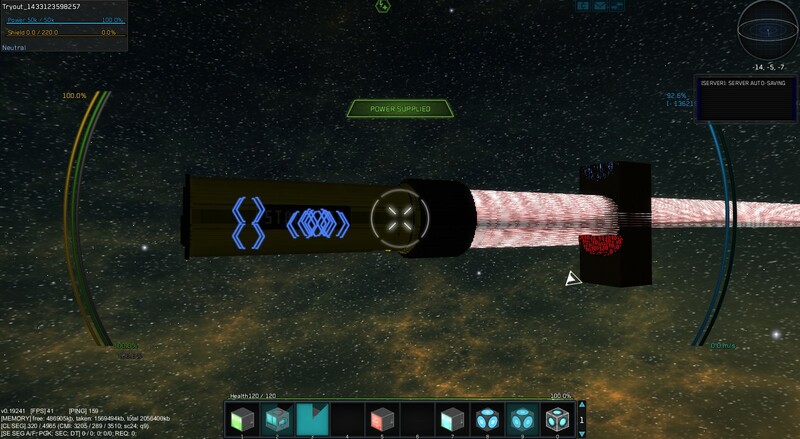 33Cav added a comment to T2212: Steam forces starmade to update. Not forcing updates for games on Steam is usually done by only having the launcher validated through Steam's update service. This would require all updates to the actual game to be done manually in the Starmade launcher after opening it. 33Cav added a comment to T1910: Rail doors do not work. Worked with Tester to find the issue. Somehow a rail speed controller was linked to all the rails on my station for no reason (even though the rail speed controller had a high ratio set on it). The doors now work as intended. Originally when I noticed this problem I constructed a test rail door on the same entity (my space station) to see if it was caused by the change regarding collisions. This door did not work. Another player reported that their rail based moving entities (in this case an elevator) were working. 33Cav created T1910: Rail doors do not work. 33Cav added a comment to T1669: Leaving to main menu instead of desktop causing issues. Another issue I have also noticed that it takes quite some time after exiting to main menu before memory is de-allocated from the StarMade process (if at all). Entering back into a world (the same MP server as I was just on in this case) has the previously "used" memory counted as "used" still and now new memory is being taken up reloading chunks in the world. As a consequence of this I usually have to restart the entire game to free up the memory or risk poor performance (in the form of repeated game freezes) when the StarMade process dumps the older memory when I near my max memory allocation amount. Hopefully you can get something useful from my description. 33Cav created T1844: Salvaging an overheated fleet ship does not work. 33Cav added a comment to T1466: Does not correctly detect frame buffer capabilities. With Windows 8.1 and the new AMD Radeon graphics drivers (Crimson) on my laptop which also has an integrated Intel HD family card the game gives me an exception relating to OpenGL when framebuffer is enabled. I had to remove all my AMD drivers and reinstall the last release of CCC to get it working again. Note that after 5-10 minutes in game without framebuffer enabled my draw-time for frames shoots up to 500ms. 33Cav added a comment to T124: Station alignment is different. I actually C-aligned (as astronaut) and spawned in a station via blueprint that was at least 45 degrees off horizontal once. This only happened once though and I was never able to reproduce it. All subsequent station spawns while C-aligned were aligned perfectly. 33Cav added a comment to T555: Extreme lag when shotguns do hull damage. The results when firing at different block types differ wildly. When hull/armour/power capacity blocks are hit almost no performance impact can be seen on SP or MP (Craftau server has much better hardware than my machine) while hitting power reactor (and to a lesser extent shield capacity) blocks causes the performance issue on SP or MP. 33Cav added a comment to T848: module charge can go over its limit. Losing mass through moving cargo away from a ship is also a way to produce this. 33Cav added a comment to T1465: Projectiles cause a NullPointerException and beams are invisible. The only instance of invisible beams that I have been able to find is firing beams into a planet's atmosphere. The beams are visible on the outside of the atmosphere but when they are incident upon the outer edge they become invisible after that point. This was found using salvage beams and the beams still work in doing what they are supposed to. Firing salvage beams inside a planet's atmosphere draws the entire beam. 33Cav added a comment to T1406: Destroying power reactors part of a large blockgroup causes extremely low client and server performance. Procedure was to (right click) shoot target B with shooter A in the lower rear where the target's power reactors are. This results in low performance. Repeating the procedure shooting the upper rear of the target (where shields etc are) the drop in performance is barely noticeable. 33Cav created T1406: Destroying power reactors part of a large blockgroup causes extremely low client and server performance. 33Cav added a comment to T1354: Steam Hours Bug. 33Cav added a comment to T1340: Scrolling in storage picks up another item. GIF showing the bug. Note that the inventory to the left is a storage from my station and is set as personal inventory, to the right is a storage on my ship docked to said station. Though this bug is reproducible if both inventories left and right are the same (storage) and are storage on a single entity. 33Cav created T1390: DefensiveEffectType set to STATUS_GRAVITY_EFFECT_IGNORANCE for Explosive effect modules in blockBehaviourConfig. 33Cav added a comment to T1331: Textures not overwritten when game is patched. 33Cav added a comment to T1350: Thrust config not saved in Blueprint. Works fine for me when creating a shipyard design from a blueprint with thrust changed on it and using the shipyard to build it. The only way I can think of for that to occur is for the state to be saved along with the blueprint in the first place. 33Cav set Task Type to issuetype:bug on T1340: Scrolling in storage picks up another item. 33Cav created T1340: Scrolling in storage picks up another item. 33Cav created T1331: Textures not overwritten when game is patched. 33Cav added a comment to T752: Shipyard loading issue and greyed out buttons. The case that I mentioned had not managed to get to a stage where any other errors mentioned here could apply. In other cases I have seen the hanging at 80-90% but the design loads fully in the shipyard even when that happens in the computer for me. 33Cav added a comment to T1316: NULL POINTER REQUESTED TYPE IS 0 Build blocks + multiplayer + advanced build "UNDO". 33Cav added a comment to T1286: Map screen in build mode contains heavy graphical glitches. 33Cav created T1317: shipyard core anchor becomes invisible after shipyard encounters 1 or more issues. 33Cav created T1316: NULL POINTER REQUESTED TYPE IS 0 Build blocks + multiplayer + advanced build "UNDO". 33Cav added a comment to T506: Memory setting should be set in fixed steps, 512, 1g, 1.5g 2g etc + no option to go over 2g for x32. Is there some problem with having a textbox that is validated against system max RAM? I often set my RAM to values such as 5800MB, a value that is unlikely to be on the proposed slider. 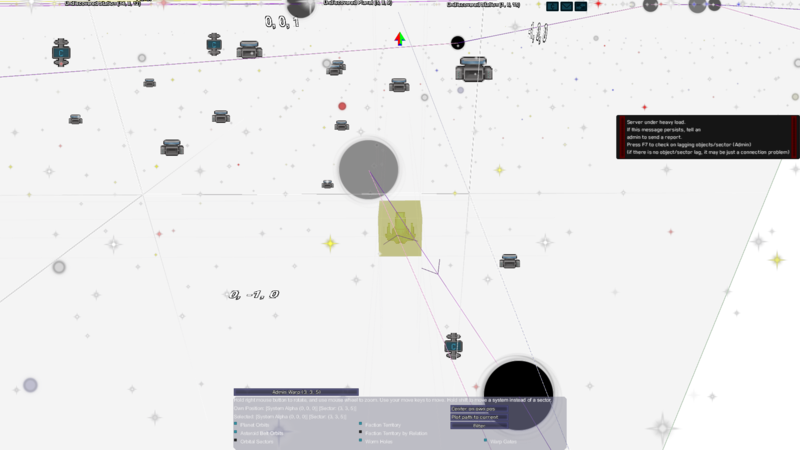 33Cav added a comment to T534: F5-screenshots of galaxy map appear with background transparent. FYI reinstalled JDK 7 and JRE 7 confirming 64-bit on both. Given that having JDK 8 and JRE 8 caused this RAM overuse issue, and given that I require the use of both JDK and JRE on my system I see no alternative to using JDK8 and JRE7. Also note that when I installed JDK8 (after a fresh Windows installation) I was not prompted to install any JRE and had to go find and get the JRE (apparently there was only JRE7 available at that time). 33Cav edited the description of T685: Game freezes for 1-2 seconds when shift clicking jump drive modules from inventory to storage..
33Cav created T685: Game freezes for 1-2 seconds when shift clicking jump drive modules from inventory to storage..
33Cav added a comment to T652: docked entries undock and spawns nearbly the ship sometimes when logged out. Happened to me just now actually. Logged off last night from the server and logged back on to find my ship in the same place but undocked. AFAIK no server restart was carried out during this period and my ship/sector would probably have not been loaded again at all until this morning when I logged on the server. 33Cav added a comment to T676: When in windowed mode and not at max resolution, clicking the maximize button on the Starmade game window does not maximize the first time it is pressed. I think AndyP is saying that the screenshot is transparent background and not white (if white was mentioned before at all). 33Cav created T676: When in windowed mode and not at max resolution, clicking the maximize button on the Starmade game window does not maximize the first time it is pressed. 33Cav added a comment to T91: beams have trouble hitting ships at extreme ranges. It helps but your information seems to be slightly incorrect. 2 issues remaining for beams. The piercing effect doesn't start from the correct position, seems that the position it start from is not properly rotated with the ship direction and keeps using the sector alignment. Beams still hit even if your circle is white but when it is white, it won't apply the standalone piercing effect. so instead of killing 20-30 blocks in my case, I killed 5 (1 for each tick). The circle itself seems to turn white from time to time and heavily depends on range and thickness of target. That's probably better for another task though. 33Cav added a comment to T671: Not all weapons trigger response fleets. Yes to both full screen and windowed to both in galaxy map and in normal space issues. Settings as posted above, not an anti-aliasing issue as this has occured previously when aa is off. Request that someone else who has this problem also test taking a screenshot in a sector that has a pitch-black background (procedural background should be ON for this) and posting the results here. If the background in the screenshot is also white/transparent perhaps the issue would then be related to the pitch-black background? My video card is AMD Radeon R7 M260 and I have AA set to 2x. My question is if players with different card manufacturers have this issue then how can it be due to the actual gpu itself? 33Cav added a comment to T588: Undocking a ship without moving the mouse does not allow ship rotation using X/Z keys. On the ship: Rail docker block is placed such that the face that will be mated with its counterpart while docked is on the front of the ship. The block is rotated such that the arrows on that face of the block are pointing "up". Only blocks around this are the black standard armour that it is placed on, although there us a camera within 10 blocks. 33Cav added a comment to T582: Power supply beams cause massive framerate drops if they are docked to a ship. I've had no major problems with power supply beams used in this manner and the ship I had it on was on a much larger scale. Just don't try and delete all the docks at the same time. Just realised that my test earlier is invalid, as I had rotated the rail docker previously to another orientation. The correct orientation is (one that it occurred on): docking face forwards in the Z axis, arrows pointing up along the Y axis. The dock is the same (of course opposite Z dir. 33Cav added a comment to T601: tab+F8 broken with stations. 33Cav added a comment to T544: reboot key combo (tab+y) in astronaut mode causes nullpointer. The 'tab' part of that key combination has no effect, pressing Y is intended to reboot stations and repair the armour at the same time. Just tested both rail basic and turret axis with the ship in question and the station in question. I was not able to reproduce this issue in the 5 minutes I spent. Although the fact that it happened over two versions and two different ships on the same station is interesting. Did it happen while on a server, or in single player ? And did it happen more then once ? Did restarting the game fix it ? 33Cav added a comment to T595: Second Missiles Wont Fire. It is possible that the amount of missiles you are firing is indeed causing some not to render visually. Indeed the same thing happens to me on SP except in that case since you are it in terms of being the server the extra missiles don't seem to actually apply damage/exist. You can of course change the amount of missiles that are rendered in the graphics settings. 33Cav added a comment to T585: Clicking on the tab scoreboard while in build mode places the selected block. 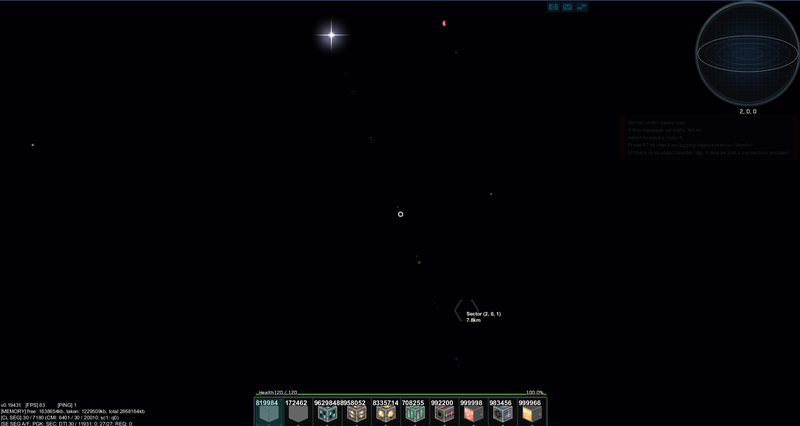 Scrolling on blueprints UI element (for example) while galactic map is open zooms on the galactic map. 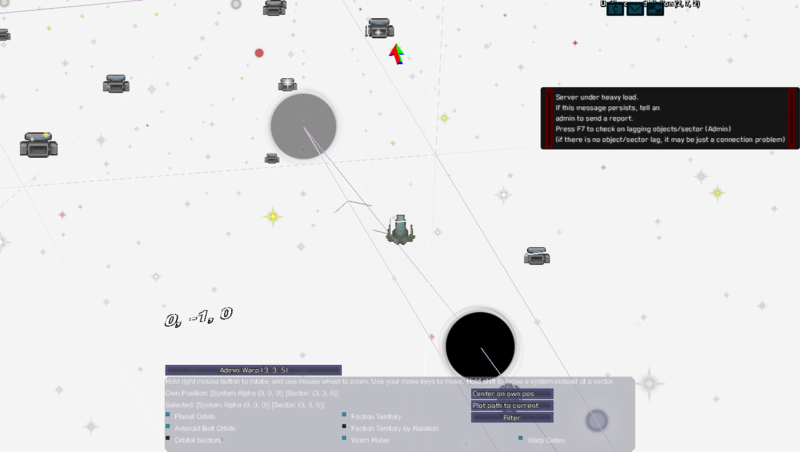 Docking ship to a station, undocking into an area that is within the station's bounding box. 33Cav created T588: Undocking a ship without moving the mouse does not allow ship rotation using X/Z keys. 33Cav created T585: Clicking on the tab scoreboard while in build mode places the selected block. 33Cav renamed T584: Adaptive message appears over Remove/replace button in ADV build mode from "Adaptive message location GUI bug in ADV build mode" to "Adaptive message appears over Remove/replace button in ADV build mode". 33Cav created T584: Adaptive message appears over Remove/replace button in ADV build mode. 33Cav added a comment to T468: Ships randomly overheat for no reason. Some players reporting that upon entering a specific sector their ship is given an 8000 day reboot timer (I think that's the number?). Unsure if issue can be fixed on server restart. Issue affects multiple ships. Doubtful there is way to reproduce on your end but I though I would give you all the information I can. 33Cav added a comment to T553: AI on multi-turret chain set to shoot at missiles shoots at all. I didn't thoroughly test that part, just left it as is when I saw it happen. All I know is that before it left SP it was set to turret and missile and that is not how it arrived when I blueprinted it in. Or create a ship-ai-type that hunts missiles, both solutions do not really feel right. -Set end of chain as follows "Turret, Missile, ON"
-Set middle of chain to "Ship, Missile, ON"
The issue is not that either of the turrets fail to shoot at missiles, but that the middle of the chain acts like it is using the "All" setting for targets. This results in the end of the chain firing at missiles, and the middle of the chain firing at ships FIRST in a combat situation. A problem which may be related occurs for me (and other players using significantly different hardware). Taking a screenshot near the edge of some systems (where the background appears pitch black) results in transparent backgrounds for those screenshots. 33Cav added a comment to T554: Shooting at pirate stations does not cause pirates to spawn and engage you. The final test was with missiles, all previous tests were conducted using cannons and beams. 33Cav created T554: Shooting at pirate stations does not cause pirates to spawn and engage you. Setup I am using in case you are not sure what I mean. 33Cav created T553: AI on multi-turret chain set to shoot at missiles shoots at all.